The Internet and computers are accessible to only half of the population in the world. For the other half, computers and the Internet are almost alien concepts. This half has no medium for gathering information, and they are computer illiterate. In addition, it is well-known, that the use of computers and the Internet, directly and indirectly, enhance the learning process. Therefore, students from under privileged areas of developing regions of the world are, clearly, at a disadvantage compared to their peers in developed countries. However, mobile phones could change this situation. In developing countries, mobile phones are far more accessible than computers or Internet access. 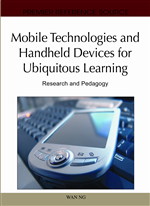 This high accessibility together with the multiple functionalities of mobile phones, allow for the potential to build feasible educational applications that enhance the learning experiences of students in developing countries. Such opportunities enable the students’ experiences to be made proportionate to the other half of the world, with a real mechanism for gathering information. Even though, there has been an increasing usage and access to Information Communication Technology (ICT) worldwide during the last few decades, the digital divide between developed and developing regions still remains (ITU, 2009). In developed countries a well established ICT infrastructure exists in industrial, business, governmental and home environments. The infrastructure is available in big cities as well as in small villages. In contrast to developed countries, with a few exceptions, developing countries have little access to ICT infrastructure. The access and availability of ICT among developing countries is unequal, even within the same country. While some developing regions face a lack of global ICT infrastructure in their territories; other developing countries have a relatively satisfactory ICT infrastructure in urban areas (and/or for the wealthier populations), and a poor or non-existent ICT infrastructure in rural areas (and/or for the poorer populations). Sub-Saharan Africa and Latin America are representative examples of the former and latter situation respectively. Although the earlier personal computer dates back to the end of the 80s and the Internet has been publicly available since the 90s, access to computers and the Internet in developing regions remains behind compared to developed regions. According to the data from ITU (2009) and the UN (2008) the proportion of household with computers in developed economies is over 75% in comparison to roughly 24% in developing countries. The proportion of households with Internet access in developed countries average 63% and only 16% in developing regions. Therefore, the majority of the population in developing regions has no access to computers or to the Internet, and it is very probably that many of them have never used or even seen a computer in their lives. Table 1 shows a summary of ICT access in households in developed and developing regions. Access to Information and Communication Technology (ICT) in households in Developed and Developing Regions (ITU, 2009).